March 1 is the official start of the sea turtle nesting season. People can help sea turtles that nest on Florida’s beaches at night by leaving the beach as natural as possible. To do this, beachgoers should remove beach furniture and other obstacles before sunset each day. “Anyone spending time on Florida’s beaches can do something to help save Florida’s threatened and endangered sea turtles. People’s actions on the beach can have a positive impact on whether our loggerhead, leatherback and green sea turtles nest successfully,” said Dr. Robbin Trindell, who leads the Florida Fish and Wildlife Conservation Commission (FWC) sea turtle management program. 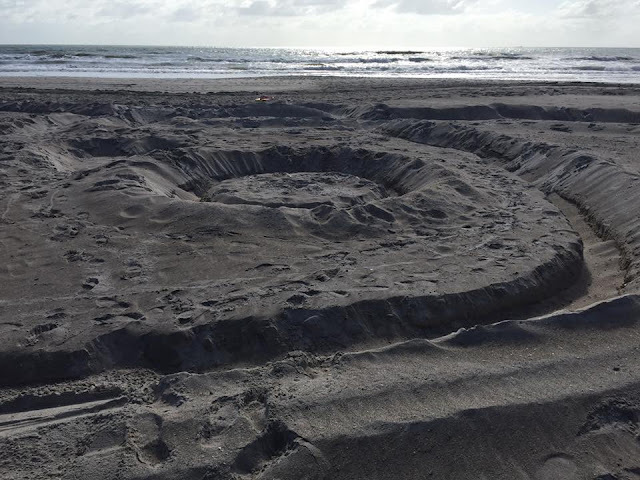 Trenches and holes left by a sand artist celebrating Earth Day 2016 created a hazard for endangered nesting sea turtles in Cocoa Beach, Florida. Exactly when sea turtle nesting season starts depends on where you are in Florida. While it begins in March on the Atlantic coast, it starts later in the spring, in late April or May, along the Gulf coast. Yet wherever you are in the state, what you do on the beach can make a significant difference on whether sea turtles nest successfully. In the 2016 sea turtle nesting season, more than 120,000 loggerhead nests, more than 5,000 green turtle nests and over 1,000 leatherback nests were documented by the FWC. With Florida hosting nearly 90 percent of loggerhead nests within this species’ northern Atlantic Ocean population, the state plays an important role in its conservation. From now through the end of October, three different species of sea turtle will land on Florida’s Atlantic and Gulf coast beaches to lay their eggs. MARCH - JULY: Leatherback sea turtles begin to come ashore from March through July to lay their eggs. Florida is the only state in the continental U.S. where leatherback sea turtles regularly nest. With the exception of a few nests on the west coast, leatherbacks nest almost exclusively on the east coast of Florida. In fact, about 50 percent of leatherback nesting occurs in Palm Beach County. APRIL - SEPTEMBER: Loggerhead sea turtles typically nest in Florida from April through September. In the United States, 90 percent of all loggerhead nesting occurs in Florida. The majority of this nesting takes place on the east coast of Florida. In fact, in Brevard County there were 23,457 loggerhead nests in 2014. JUNE - SEPTEMBER: Green sea turtle nesting in Florida occurs from June through late September with the highest concentration of nests along Florida's east coast - but green turtle nests have been found in every coastal county of the Sunshine State. 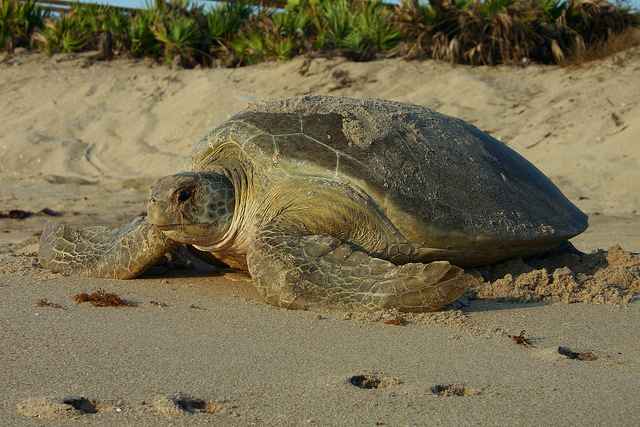 Report sick, injured, entangled or dead sea turtles to the FWC’s Wildlife Alert Hotline, 1-888-404-3922 (FWCC).